Left: Martha Benjamin beat them all, 1963. Right: Father Mouchet, 1963 "Martha is steel!" "Martha beats them all" a STAR headline proclaimed in 1963 when an Old Crow skier and mother of five children became the first Yukoner to win a national skiing title. 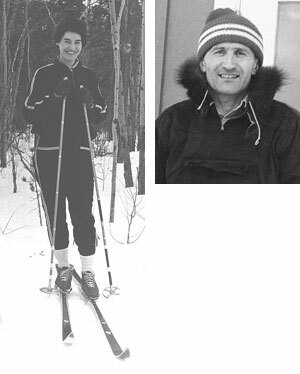 Twenty-five year old Martha Benjamin won the senior women's cross country skiing title at the Canadian championships in Midland, Ontario. Her time over the 10 kilometre race was 43.29 minutes. And in 1989, 26 years after that historic event, Benjamin was inducted in the Yukon Sports Hall of Fame. "After all these years, I didn't expect to receive something like this," she said. "I just had it in me that I wanted to do it, and I did it," she said of her win in Midland Ontario. Benjamin and Ben Charlie were the only two skiers to attend the championships. Charlie ranked 11th in a field of 48. His toughest competition came from a group of Finns from Sudbury who swept the field. Both skiers brought high credit and distinction (not to mention the publicity) to their community and to the Yukon as a whole. Star correspondent Edith Josie wrote before they left: "I had wire from Mr. Harry at Whitehorse. He said Ben Charlie and Mrs. Martha Benjamin will go to Ottawa for International Olympic Competition for skiers on February 13. Frank Cook will take them out. Everyone is very glad to hear these two will go out long travel. Hope they had good trip. Old Crow is little town and Father Mouchet is training boys and girls for the skiers. Now they even go way out to Ottawa. Sure big surprise for the people in Old Crow." And when they came back, she wrote: "The skiers arrived back in Old Crow. Sure nice to see them. They really tired when they get to Old Crow. They've been doing ski races and travel and were sure tired. I hear that Mrs. Martha Benjamin, Ben Charlie and Isaac Thomas will go back to Ottawa for training. I hope they stand it when they practice." Benjamin, along with Charlie and Thomas, went on training for the Olympic team but family obligations kept her from landing a spot. The trio, along with many other residents began cross-country skiing in the early 60's when an Oblate missionary and RCMP officer introduced the sport to Old Crow residents. They were taught that skiing, like snowshoe running, increased physical fitness and stamina. Constable P.A. Robin and Father Mouchet ordered skies, cleared trails and formed a ski club. Mouchet, an experienced ski instructor for the French army, designed a training program which is now called TEST (Territorial Experimental Ski Training). This program strives to stimulate and motivate children to discover themselves, develop self-reliance through a rigorous training schedule and gain self-confidence through a series of tough, but surmountable challenges. In an excerpt from a 1963 edition of the Star. Father Mouchet of Old Crow stated, "Old Crow has the potential. Martha is steel. She could go on forever. Old Crow skiers have the ability to find a source of energy that we don't know exists." Funds raised by residents of the Yukon were used to support the Old Crow skiers. An excerpt in March 1963 says they have "shown rapidly increasing form and style. After being defeated in Prince George by Western Canadian Champion Ostein Bannebo, they defeated Bannebo two weekends ago at the Sourdough Rendezvous when he came North because he felt they deserved another chance." The fundraising project was directed toward "developing a potential in a people who are generally not given the opportunity to show the physical ability and physical fitness that they do possess." A spokesman, who was not identified, said "the effects of the physical fitness being exercised by the individuals now engaged in this competition have a far reaching effect and should not be thought of in terms of what direct benefit this will be today, but the overall effect that the competitors will have upon their fellow citizens of Old Crow in the ensuing years." "This program is not intended to be a 'flash in the pan' sort of venture but it is planned to be a continuing project on a 12 month basis to develop in the native people a sense of both physical and mental fitness unequaled." In the fall of 1963 Edith Josie added this to her news: "One of aircraft arrived Old Crow and Mr. Cameron, Commissioner in Whitehorse, sent all his greeting. And also he sent pictures of Mrs. Martha Benjamin who is Canadian Champion woman cross country skier. It is very nice to hear about her and everyone know how good she was in ski all over Canada. Everybody are business but the meeting was open in community hall at 3 p.m. So every men and women to meeting because they really glad for Mrs. Benjamin is doing very nice on skis."